The Business Requirements Checklist is a simple, step-by-step action plan for gathering and documenting business requirements that are identified according to interests and concerns of stakeholders. This checklist can be used in both business planning and project planning. 1. Business Requirements Gathering Methods. There is a wide range of approaches and methods to collect business requirements. Each separate method has its benefits and pitfalls, but when all methods are used in combination they provide a better understanding of business requirements. Below we give several key methods and approaches to collecting business requirements. One-on-One Meetings. A meeting with two participants helps promote more detailed discussions on business requirements specification. It allows actively communicating with individuals who may be prone to staying quiet in group discussions. One-on-one meetings also help build trustful relationships with each group member and stakeholder and also understand their individual perspectives regarding business requirements. Interviews. Group interviews help accelerate the process of gathering business requirements. Interviews allow group members to hear and discuss ideas of others to further their understanding of business requirements organization and provide inputs for decision making. Facilitated Group Sessions. This approach to business requirements gathering allows larger groups and focused teams to further the process by collecting all requirements in one facilitated session and then moving the group toward consensus. Questionnaires. 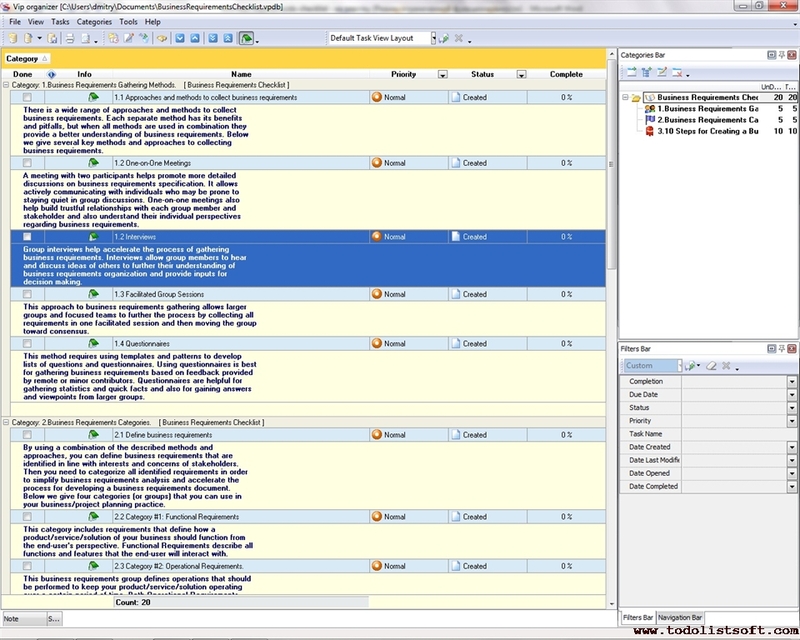 This method requires using templates and patterns to develop lists of questions and questionnaires. Using questionnaires is best for gathering business requirements based on feedback provided by remote or minor contributors. Questionnaires are helpful for gathering statistics and quick facts and also for gaining answers and viewpoints from larger groups. By using a combination of the described methods and approaches, you can define business requirements that are identified in line with interests and concerns of stakeholders. Then you need to categorize all identified requirements in order to simplify business requirements analysis and accelerate the process for developing a business requirements document. Below we give four categories (or groups) that you can use in your business/project planning practice. Category #1: Functional Requirements. This category includes requirements that define how a product/service/solution of your business should function from the end-user's perspective. Functional Requirements describe all functions and features that the end-user will interact with. Category #2: Operational Requirements. This business requirements group defines operations that should be performed to keep your product/service/solution operating over a certain period of time. Both Operational Requirements and Functional Requirements should be reviewed and tested before your product/service/solution is transferred to the end-user. Therefore, you need to consider conducting business requirements testing. Category #3: Technical Requirements. This category includes all requirements that characterize technical issues to be considered to successfully run your business and create the product/service/solution. Category #4: Transitional Requirements. This category contains requirements that define how the product/service/solution should be implemented and transferred to the end-user in a proper way. 3. 10 Steps for Creating a Business Requirements Document. Make a clear understanding of problems your business encounter with. Identify all stakeholders (people who have an interest or concern in your business initiative) and involve them in setting up business requirements from the start. Make sure each stakeholder can provide support and advice during the process of managing requirements. Organize a business requirements presentation with stakeholders to review and document all business data, including workflows, outstanding problems, current needs, anticipated risks and planned performance metrics. Try to use quality-proven methodologies and tools to ensure that business data conforms to your business expectations. 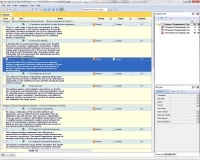 Develop templates for business requirements documentation. Be sure an appropriate terminology is used throughout all documentation. Also there should be a dictionary that describes special terms, abbreviations and expressions. Avoid using unfamiliar words that cannot be quickly understood.